Synopsis : To claim that the co-ordinating powers of the market constitute a natural order, there is a need to show not only that such an order exists (i.e. synchronic order in the sense that it achieves a co-ordinated outcome to economic interactions) but also that it does not offend people’s moral sensibilities (i.e. that it is also a diachronic order). One way of achieving this is by making the system universal and ethically neutral. The way modern economics proposes to do this is by adhering to strict methodological individualism and by removing the ‘other’ (except as someone whose actions may affect us) from all economic considerations. As individuals exist in all societies, and as it is the attitudes towards the ‘other’ which may distinguish one society from another, economics claims to have produced an idea of an order which is universal and independent of ethical or social dispositions. 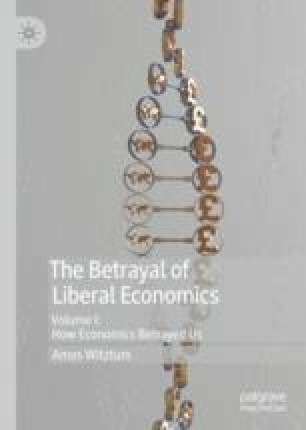 In this chapter, we examine how economics proposes to achieve this outcome and whether it has been successful in its endeavour. 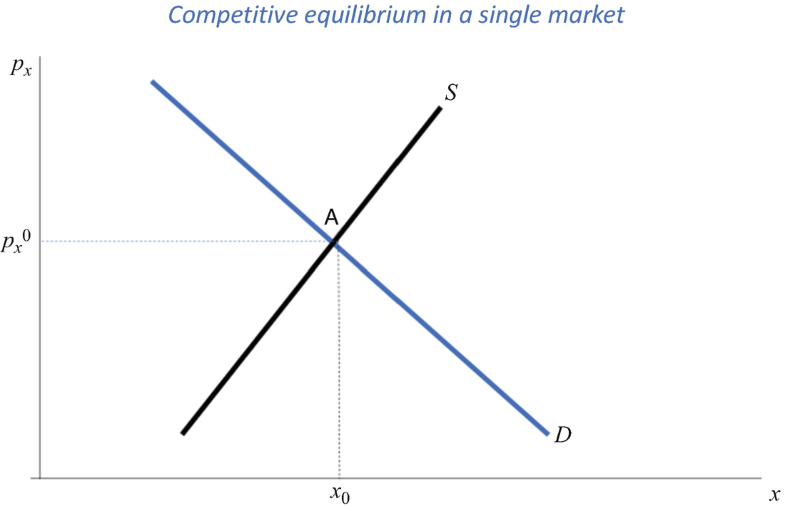 Walras , the rationalist, discovered in his Elements of Pure Economics that as the essence of goods is utility, there exists a vector of prices for which all rational plans coincide and all markets, without exception, are in equilibrium. This vector of prices, the Walrasian prices in their modern transformation, has all the properties of efficiency required by the solution to the economic problem. However, for Walras, the rationalists, these prices were actually the essence of values but not necessarily the actual market price. In this respect, Walras was following the traditions of economic thinking, according to which there is always a difference between ‘value’ and ‘price’. They did not all mean the same thing, but one can trace such a distinction all the way back to Aristotle. In his theory, he distinguishes between what he calls a ‘just price’ and the actual market price that will emerge. By ‘just price’ Aristotle was referring to something akin to labour theory of value by expecting this price to reflect the relative difficulties of attainment. As the objective of Aristotle’s theorising was to find the conditions which would support what he called the just, or good, society (alternatively, the society which would support the good life understood as eudemonia). In such a society, material wellbeing is not the objective and, therefore, the production and exchange of it should be based on needs. Trade for the purpose of wants is immoral. Therefore, to some extent, the just price was the measure of how well the system operates. Without the middlemen, who will appear when trade becomes wants-based, prices of good will correspond to the just price. Therefore, just price is a form of value against which one can measure prices and decree whether the system is working well. St Thomas of Aquinas followed suit and even in Adam Smith one can find a similar concept in what he calls the ‘natural rate’. Natural prices, for Smith, were a benchmark for whether or not the system of natural liberty is consistent with morality and justice.46 When market price deviates from their natural rate, there is something not right about the system. Ricardo too was looking for an absolute value but the purpose of this was somewhat different. In Marx, however, the use of the distinction between values and prices becomes more acute. Marx, being a rationalist like Walras, finds that the labour is the value embodied in all commodities. This led to his famous labour theory of value, which was, like that which Walras did later, a search for the essence of things. Marx was very much aware of the fact that market prices deviate from labour values and it is through this deviation that the exploitative nature of the system is revealed. Many interpreted the labour theory of value as the explanation for prices and were therefore concerned with the most intricate of problems: the problem of transformation. How do labour values explain market prices? Not much good came out of this exercise and for a good reason. The labour values were a benchmark, a reference point, rather than an explanation of prices. So, Walras too was concerned with the question of how actual market prices relate to the values of goods which are the general equilibrium prices. In some sense, this is similar to the problem we have posed in the text. Here, the Walrasian prices are the paradigmatic core and actual market prices represent reality. Therefore, the question of whether there is convergence is really a question of whether there exists a process, in principle, which will lead actual market prices to their Walrasian values. Walras himself was baffled by this and proposed a somewhat peculiar process known as the Tatonnement (or groping). But there have been many questions raised both about the realism (i.e. whether it is really a possible process) of the process and about its convergence. Scarf (1960)47 demonstrates the problem in a very simple context. The fact that we have no convergence in such a simple case raises serious doubts on the generality of any other account. There were also attempts to devise simple sequential bargaining processes, but these too did not seem to lead to Walrasian prices.48 Mandel and Gintis (2014) propose that a solution can be found if we adopt an evolutionary game approach, but this raises a serious question about what we mean by the idea of competition. Moreover, the conditions of the structures which may generate convergence are far too specific to make this a sufficiently generalised proposition. This, of course, is only one market but assuming all other markets in equilibrium (their prices would affect the position of both demand and supply), the price where this market too is in equilibrium—and thus the entire system—is, of course, the price corresponding to point A. 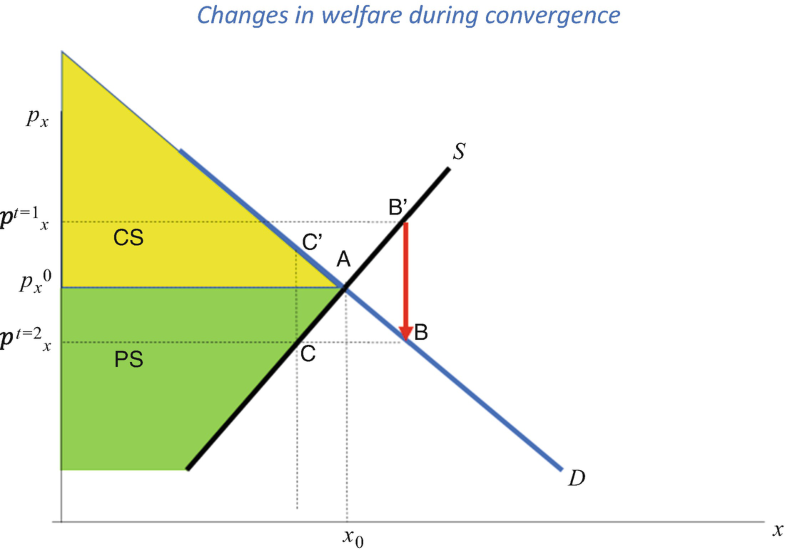 So, we know that there exists a price for which there will be a Walrasian general equilibrium and where the allocation of resources and distribution of outcomes are efficient. Now, the question is, how do such prices form? Clearly, the demand and supply schedules do not really exist; they tell us what we think would happen, had people been rational, when prices change. But in the real world, there is a price and that is it. But the model does not tell us how the price is being determined. Let us, therefore, devise a very simple and intuitively appealing story to describe this dynamic. If the price at the end of today (t = 1) is where it is, producers who maximise profits will bring to the market the quantity dictated by the marginal cost curve (supply). But during the day they will discover that at this price the quantity demanded is less than that. This means that they will find that there is excess supply in the market. As they cannot keep their goods from one day to another, sellers will declare a sale and prices will fall to the level at t = 2, where the sellers will be able to sell all their goods. 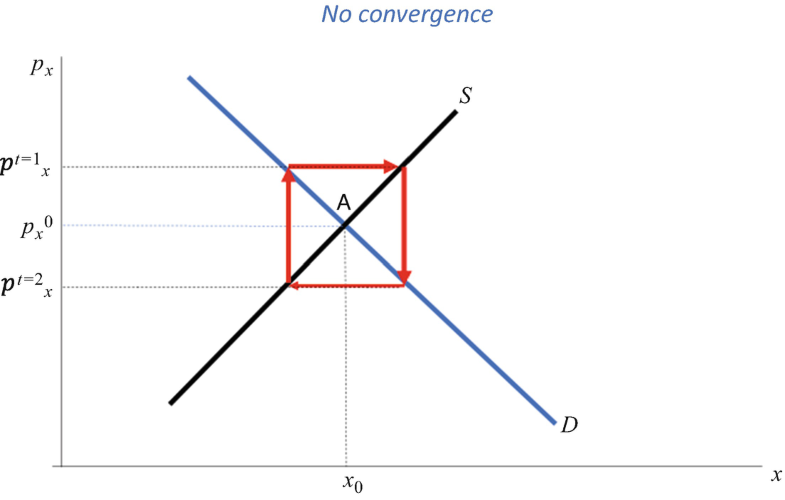 Next day, the sellers know that the price was at the level it stood at the end of t = 2 and they would therefore want to sell the quantity suggested by the supply curve. But at this lower price, quantity demanded will be greater—the opposite of yesterday—so there will be excess demand and consumers will bid up the price to get what they wanted. As price increases, quantity demanded will fall until it matches the quantity supplied. What we can see in the above diagram is that the difference between the prices in each day is falling and after a while the prices will converge to the Walrasian level if nothing else changes. This is what we mean by convergence. There is a process which, in principle, can lead to us to the Walrasian prices. The reason I say, in principle, as even the story I told was quite stylised and assumed that nothing else changes throughout the process. Nevertheless, as a process exists in principles,49 we are willing to accept that the Walrasian prices are meaningful and that we are in a constant motion towards them. The partial equilibrium representation of the efficiency of Walrasian equilibrium can be captured by the yellow and green areas which represent consumer and producer surplus respectively. The former is a proxy to the money measure of the utilities accrued to consumers at point A, and the latter is a measure of the utility generated by the market which ends up in the hands of producers. Point A is allocative efficient as we cannot increase one without reducing the other. When we find ourselves at point B (after the first day), it is easy to see that consumer surplus will be increased but at the expense of producers. Moreover, producers will have an extra cost which is not covered by the benefits generated in the market and this would be the triangle CBB′. Therefore, point B is inefficient. A similar argument can be made about point C where we find ourselves in the following day. In other words, none of the points before we get to A can be deemed as efficient. So, while we know that we will be approaching the efficient outcome, we cannot attribute the efficiency of the limit of the process (at point A) to any point on the way. Nor can we clearly see the overall net benefits monotonically increasing. In this case, we have the same story as before except that prices always fluctuate around point A but will never get to it. This is the equivalent to the Israelites who roamed the desert and who were destined not to get into the Promised Land. While it is true that the path which the prices will take as they fluctuate will be influenced by the position of point A, there will never be efficiency in this market. There was no efficiency throughout the process when it converged and there is no efficiency when they do not. But while in the previous story we could pretend that at some point—when we get to A—we will benefit from the promised efficiency, we can no longer make this claim. Can we consider A as a reference point? Well, we could but only for the purpose of being able to predict how prices will fluctuate. But, as before, we still cannot attribute any of the good properties of point A to any of the prices we observe in this very competitive market. So, the benefits are all concentrated at a point which we will never reach and there is clearly no monotonic progression in our wellbeing. What, then, is the point of pursuing greater competitiveness? That which determines whether prices will converge or not is a set of conditions on the slopes of demand and supply (and, hence, their elasticities). These conditions require a very specific relationship between the two schedules. This means that for all markets without exception, such conditions should be present. It is enough for one of the market in the economy not to have converging prices for the general convergence of the system to fail. At the same time, there is no plausible reason why all the markets should have this particular relationship between the slope of demand and the slope of supply. This is, therefore, another reason to believe that Walrasian prices, like Marx’ labour values, are merely a benchmark for the system rather than an explanation of how prices are being formed. Marxian values exposed exploitation. Walrasian values condemn competition as an eternally inefficient form of economic and social organisation. This last point is strengthened once we add to this the realisation that with missing markets, point A in the above diagrams does not constitute an efficient point either. 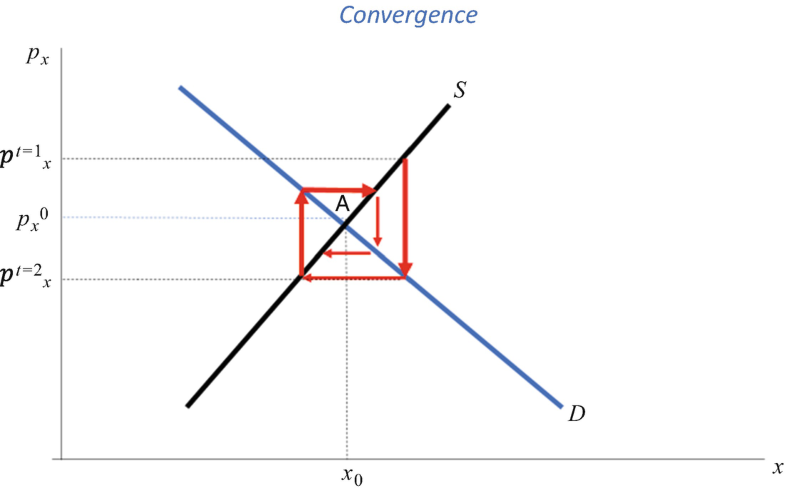 As the social marginal costs of producing x are greater than the private one—represented by the supply schedule—an equilibrium at point A means that the price does not reflect the social cost of the good and, hence, will generate allocative inefficiency. To some extent, failing to gravitate towards an inefficient outcome may be a good thing but not when every other point is equally inefficient.